In March of 2017 the staff from Music City Nashville made the two hour trek down Highway 65 for a pilgrimage to the U.S. Space & Rocket Center in Huntsville. It was one small step for man but a giant leap for our tourism reporters as our journey revealed many worlds of wonder in the northern Alabama town that is better known as “Rocket City”. The Pathfinder dominates the landscape at the U.S. Space & Rocket Center. 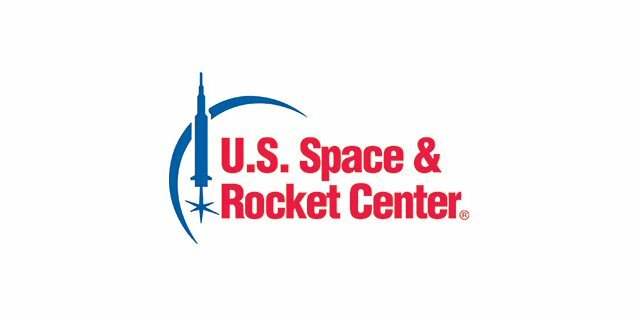 The U.S. Space & Rocket Center is nearing its half-century mark since it opened on March 17, 1970, as the Alabama Space & Rocket Center. In that time over 16 million visitors have walked through the door and it is now the No. 1 tourist attraction in the state. Fans of outer space, science fiction and future explorers flock to the destination to take part in Space Camp that uses astronaut training techniques to engage trainees in real-world applications of STEM subjects. Students sleep in quarters designed to resemble the ISS and train in simulators like those used by NASA. This is no Disneyland, either! To show the real-world impact the Center and Space Camp have had on its visitors there is a Wall of Fame of graduates who have attended Space Camp and now have careers as rocket scientists, astronauts or related industry positions. Huntsville, Alabama has been the home to many scientists and engineers since the 1940s when the remnants of the German rocket program set up shop here. The first exhibit on our tour showed “101 Rocket City Inventions” that revealed that the city has been and remains at the pinnacle of the nation’s innovation and ingenuity. 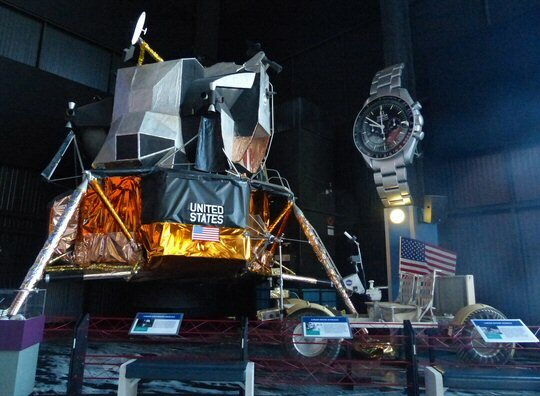 A replica of the lunar lander and lunar rover recalls the glory days of NASA. The man at the center of the Center – so to speak – is Dr. Wernher von Braun who was a German, later American, aerospace engineer and space architect credited with inventing the V-2 rocket for Nazi Germany and the Saturn V for the United States. He was a leading figure in the development of rocket technology in Nazi Germany, where he was a member of the Nazi Party and the SS. After the Second World War he was secretly moved to the United States, along with about 1,500 other scientists, engineers, and technicians, as part of Operation Paperclip, where he developed the rockets that launched the United States’ first space satellite Explorer 1, and the Apollo program manned lunar landings. Dr. von Braun’s most ambitious undertaking was the creation of the Saturn V booster rocket that would take the American astronauts to the moon. In Huntsville, the newest building at the center is the Saturn V Hall which houses one of these vehicles along with several other exhibits related to space travel and exploration. The massive cylinder is so big you can actually feel yourself getting dizzy looking up at it and it’s presence here alone is worth the price of admission. Still, there are other things to do and see at the U.S. Space & Rocket Center and a minimum two-hour stay is recommended to cover the basics. Add more time if you plan on viewing one of several IMAX movies available at staggered times throughout the day, or, if you plan on taking a bus tour of the nearby Marshall Space Flight Center. 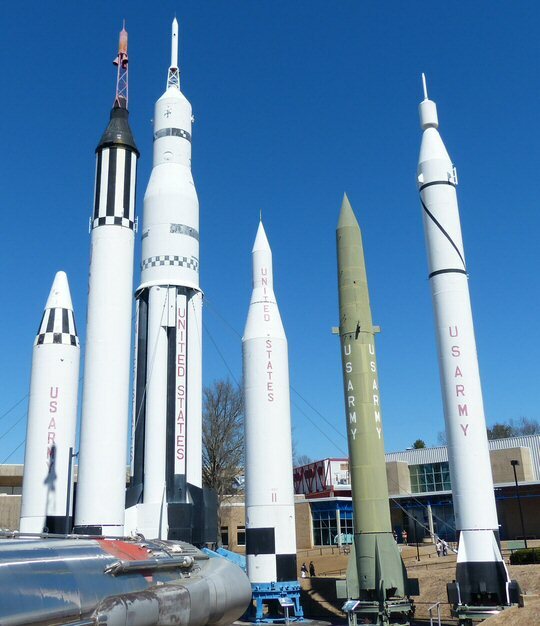 The Center’s many rockets can be seen from many points in and around Huntsville. The Center’s main exhibit area contains one of the largest collections of rockets and space memorabilia anywhere in the world and regularly features traveling exhibits from around the globe. Rocket Park is home to 27 missiles and rockets. It shows how Army rocketry launched America’s space program and gave rise to NASA’s Marshall Space Flight Center. There are also several free rides on the grounds including the “G-Force” that simulate the experience of space flight. Coming from Nashville, Tennessee we were impressed with the City of Huntsville and its surrounding region. The local government supports city-wide beautification via an awards program and the downtown has maintained its historic local flavor through an impressive architectural preservation program. The local botanical garden has just completed a $12 million dollar renovation project and the newly completed Bridge Street Town Centre offers the best in convenient outdoor shopping and dining. If you’re in the South looking for a new destination to check out this town is worth the effort and the exploration. 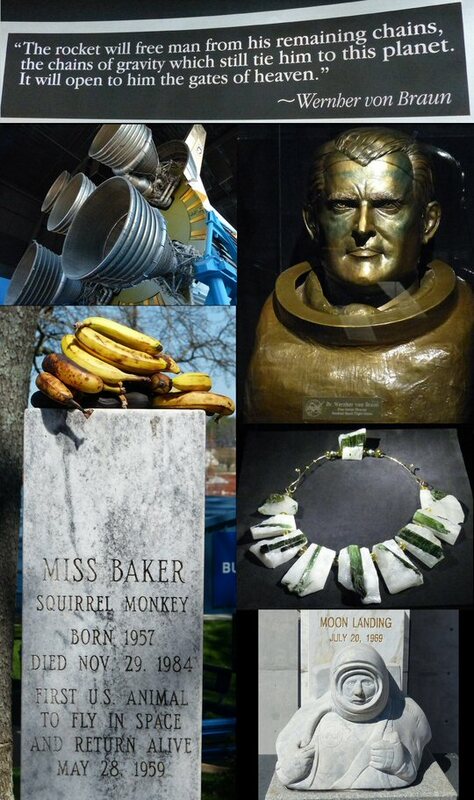 The Rocket Center honors the men, machines and monkeys in flight.